Denny Jump (Bellevue, WA, United States) on 8 November 2014 in Lifestyle & Culture. I must read up on how one 'steers' a hot air balloon . . ah : "the pilot's only ability to steer the balloon is the ability to climb or descend into wind currents going different directions. " I think I'll stay on the ground. what a fun way to commute to work and home, though !!! 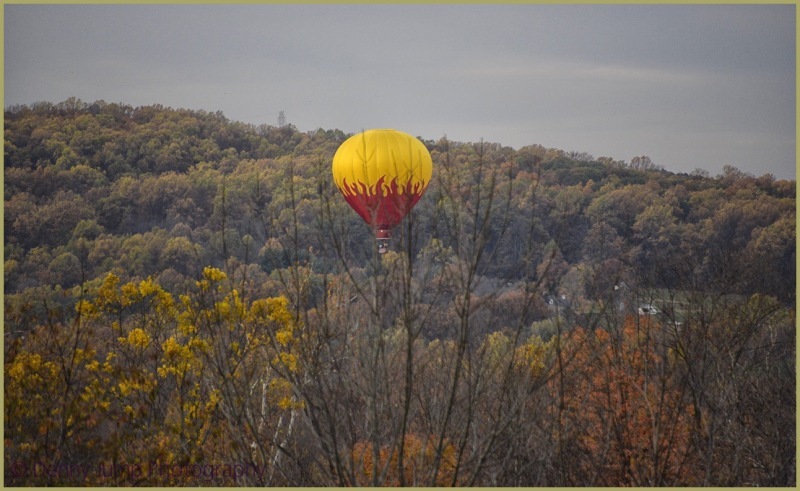 love the flaming leaves in the foreground and the flame pattern on the balloon hide ! fine capture. if it were my photograph, i would crop from the right; it would get the balloon out of the center and you don't need it. The balloon and scene is lovely, but it does look out of place among the dense foliage. A pretty shot of the balloon descending. I like that hot rod flame design on it. Awesome shot ... right place at the right time! Great colors on the balloon!